The 24-year-old who killed two and wounded 10 others after losing a video game this weekend had taken psychiatric medication linked to suicide and violence. Jacksonville, FL — David Katz, was a 24-year-old male who lost his temper Sunday morning after losing a video game and began shooting up an e-sports tournament. He killed two innocent people and wounded 10 others before her turned the gun on himself and took his own life. Now, we have learned that Katz had been on the types of psychiatric medications known to cause violent thoughts and that are linked to many of the worst mass shootings in recent history. What’s more, a separate 2006 court filing states that a therapist said he had experienced a “psychiatric crisis” while prescribed these medications. On top of the psychiatric crisis and the reported drug cocktail, CNN also obtained police records that show 26 calls for service to the police from the Katz family home in Columbia, Maryland, from 1993 to 2009, for issues ranging from “mental illness” to domestic disputes. At least two of those calls involved Katz arguing with his mother, though none of the reports provided to CNN show any physical violence. The Howard County Police Department declined to release the reports from a number of the incidents, citing statutory restrictions. David Katz’ past is eerily similar to that of Nikolas Cruz, except that his parents were both feds. Both of Katz’ parents reportedly worked for the federal government according to a law enforcement source. Katz’ father, Richard Katz is a NASA engineer employed at the Goddard Space Flight Center outside Washington, DC and his mother was listed as an employee of the Food and Drug Administration, according to CNN. Since he was a child, Katz was prescribed a myriad of drugs including the antidepressant Lexapro, and Risperidone, sometimes used to treat schizophrenia. There have been 20 drug regulatory agencies from seven different countries who’ve pointed out the dangerous side effects of Lexapro. The majority of the warning are for suicidal risk or suicidal behavior. Other side effects include, hostility or aggression, agitation, anxiety, mania or psychosis, irritability, and violence. According to CNN, Katz’ father disputed the necessity of the drugs and a psychiatric evaluation sought by David’s mother, suggesting that his son instead “attend a support group for middle school students.” “Richard Katz has seen no evidence whatsoever of schizophrenia in David Katz,” a motion from his father’s lawyer said. Despite the dozens of police reports stemming from Katz’ behavior, the laundry list of drugs he was taking to treat his “psychiatric crisis,” the fact that he was in treatment for psychiatric issues, and the fact that it was documented that he’d had multiple mental breakdowns involving the police, Katz submitted his fingerprints, underwent a background check, passed a firearms safety training course and legally purchased a 9mm handgun and a .45-caliber handgun in Maryland last month. 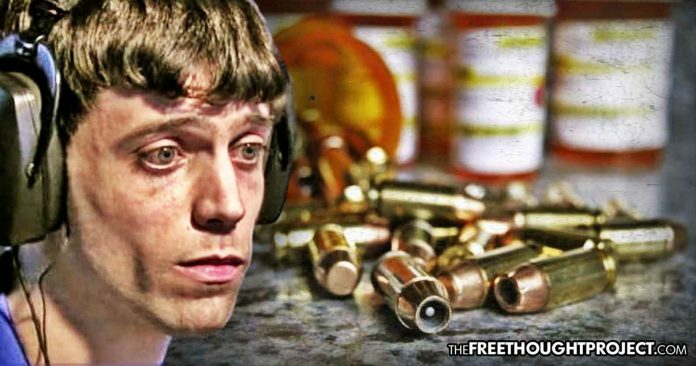 As TFTP has reported on numerous occasions, the majority of mass shooters have links to psychological medications that carry serious warnings for side-effects on their labels. Stephen Paddock, Omar Mateen, Gavin Long, Eric Harris, Dylan Klebold, James Holmes, and Nikolas Cruz, all have one thing in common other than the mass murders they carried out. They were all reportedly taking prescription drugs which alter their state of mind and carry a host of negative side effects ranging from aggression and suicide to homicidal ideation. Despite this deadly laundry list of potential reactions to these medications, their use has skyrocketed by 400% since 1988. Coincidentally, as antidepressant use went up, so did mass shootings. The website SSRIstories.org has been documenting the link between selective serotonin reuptake inhibitors (SSRIs) and violence. On the website is a collection of over 6,000 stories that have appeared in local media (newspapers, TV, scientific journals) in which prescription drugs were mentioned and in which the drugs may be linked to a variety of adverse outcomes including most of the mass shootings which have taken place on US soil. As the Citizens Commission on Human Rights notes, before the late nineteen-eighties, mass shootings and acts of senseless violence were relatively unheard of. Prozac, the most well known SSRI (selective serotonin reuptake inhibitor) antidepressant, was not yet on the market. When Prozac did arrive, it was marketed as a panacea for depression which resulted in huge profits for its manufacturer Eli Lilly. Of course other drug companies had to create their own cash cow and followed suit by marketing their own SSRI antidepressants. Subsequently, mass shootings and other violent incidents started to be reported. More often than not, the common denominator was that the shooters were on an antidepressant, or withdrawing from one. This is not about an isolated incident or two but numerous shootings. The issue of psychotropic medication playing a role in mass shootings is not some conspiracy theory. It is very real and the drug manufacturers list these potentially deadly side effects on the very inserts of every one of these drugs. But the mainstream media and the government continue to ignore or suppress this information. Why is that? It is no secret that the pharmaceutical industry wields immense control over the government and the media. It is their control which keeps any negative press about their dangerous products from airing. However, most people likely do not know the scope of this control. As Mike Papantonio, attorney and host of the international television show America’s Lawyer, explains, with the exception of CBS, every major media outlet in the United States shares at least one board member with at least one pharmaceutical company. To put that into perspective: These board members wake up, go to a meeting at Merck or Pfizer, then they have their driver take them over to a meeting with NBC to decide what kind of programming that network is going to air. In the report below, Papantonio explains how the billions of dollars big pharma gives to mainstream media outlets every year is used to keep them subservient and complicit in covering up the slew of deadly side effects from their products. How much longer will we allow these billion-dollar drug companies to control the narrative and not let this conversation take place? How many more mass shootings will take place before Americans wake up to this reality?